I was recently cleaning out some old papers in my office and ran across a fat file containing an old training session on anger management. As I leafed through my handwritten notes and the overhead transparencies, I was struck by more than how much the technology has changed in 25 years. I was amazed at how much my mind had changed about the function and value of that powerful emotion. As I scanned through my theology of anger, I still agreed with how I explained the rightness and justice of God’s wrath. And I was okay with my explanation of aggression, passivity, and assertion. The aspect of my presentation that bothered me most was my relatively positive stance toward anger in humankind. Mind you, I wasn’t advocating for people flying off into rages or even some ill-advised pop psychology notion of “getting your feelings out.” I simply over emphasized the idea that anger isn’t always bad. If I were to teach the same session today, I would change the focus to: anger is almost never good and helpful in relationships. As I mentioned, I have not changed my stance on the wrath of the Lord. I still absolutely understand and appreciate the how, what, and when of His anger. And I still believe that people who complain, “The God of Old Testament is so angry and mean” really need to actually read the Old Testament. My main problem with anger doesn’t involve God, it involves me and my fellow humans. When I think back on all the issues I have railed against, the expressions of indignation I have spouted off about, and the passionate denouncements of “wrongs” I’ve made…I feel embarrassed and tired. I could always justify my anger as a courageous advocacy for the truth. But realistically, I was advocating more for my own ego and my self-justification. The truth was rarely well represented by my irritation. In my counseling office, I have seen countless relationships destroyed by anger. I have yet to observe a single marriage or friendship that experienced more joy and peace through regular expressions of annoyance and rage. Quite frankly, I have never heard the words, “Our family gatherings are always a hotbed of bitterness and contempt. Everybody has an awesome time.” Conversely, I often hear, “My father was continuously angry in our home. But at work, he was evidently a saint. People who worked with Dad just raved about his loving kindness and joyful spirit.” That latter statement tells me that people can actually choose to be pleasant. I am not convinced that a thorough examination of one’s childhood is necessary in order to act with civility toward loved ones. After all, acting decently at work or at church apparently doesn’t require hours of painstaking therapy. People just figure it out. You and I can too. I believe that’s why the Scriptural warnings against the dangers of anger do not include a complex roadmap for overcoming it. We actually know how. Our main problem involves getting over the idea that our anger is justified and necessary. Trust me: It isn’t. I love Einstein’s quote about anger. 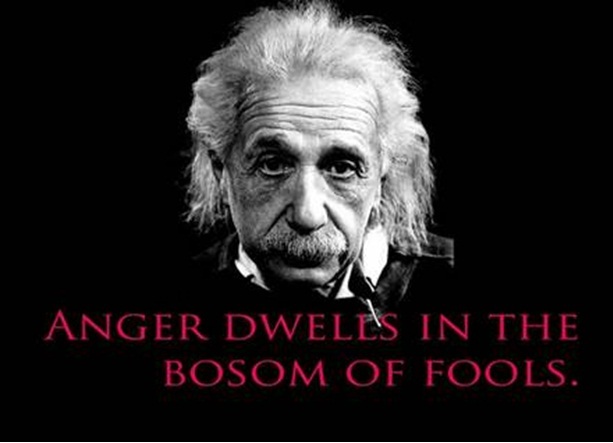 It does dwell in the bosom of fools. The Bible says even more about this destructive emotion. I’ll attach a document with my favorite reminders about the realities of anger. Check it out. God said it was a problem long before Einstein was born. Now go out there and enjoy the fortnight. And no one is allowed to be grumpy.